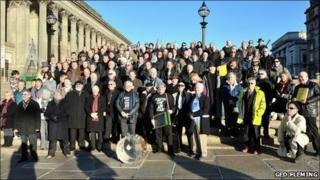 Hundreds of musicians from the past 50 years have gathered in Liverpool to recreate a famous Beatles photograph and mark the 30th anniversary of John Lennon's death. He was shot dead by a crazed fan in New York on 8 December 1980. Merseybeats and Colonel Bagshot were among those who stood on St George's Hall steps to emulate Astrid Kircherr's 1964 photoshoot earlier. A candlelit vigil will be held in the city's Chavasse Park at 2000 GMT. Other musicians who came to pay tribute to the rock icon included Supercharge and country and western singer Mike Harley. John Boase, editor of Mersey Mag, has organised the photoshoot. "Not only do we want to mark John Lennon's death, we want to broadcast to the world the array of talented musicians that we have here on Merseyside. "At first I thought there was only going to be about 100, but more and more people have been getting involved and we have had hundreds come and take part." Later, thousands of fans are expected to gather at Chavasse Park, where a sculpture has been erected in Lennon's honour, to remember what the Beatle brought to the world of art and music. It is the penultimate day of a two-month series of culture events across the city, which have been organised to celebrate the musician's life and lasting legacy.